A sweet friend invited me to come pick some of the pears from her huge pear tree recently and of course I jumped on that offer! RancherMan & I showed up at her house armed with a feed sack that typically holds 50 lbs of feed, and we proceeded to fill that bad boy up with pears! I promised to bring back some canned pears for her but she said she’s had all the pears she wishes to have this year. LOL. Having so many pears to go through I was very thankful that I had this * apple peeler to get me through it quickly. I don’t know what I would do if I had to peel that many pears with a paring knife! I found that I could peel, core & slice a pear in 5-7 seconds! WOO-HOO, watch me go! The first double-batch of preserves I made I followed the recipe exactly, but it seemed to have too much syrup and I had to boil the pears over 2.5 hours to get it to the consistency I wanted. I asked Virginia about this & she said it appeared my pears were very ripe so I should try it again with the same amount of sugar but less water & slightly more pears per batch. So for my second double-batch I peeled cored & chopped about 10 cups of pears instead of 8 and dropped them into a solution of Fruit-Fresh & water to keep them from turning dark. When I had the pears prepared I pulled out my big stock pot & stirred 3 cups sugar into only 1 cup water this time – it did seem to help the quantity of syrup. When the syrup had boiled about 10 minutes I added my prepared pears and a few slices of lemon & I only boiled the pears this time for about 1 hr 15 minutes. When they were as thick as I like I stirred in a tablespoon of vanilla & ladled the preserves into hot washed & sterilized jars, wiped the rim and placed the two-part canning lid in place. These jars can now be sealed in a hot-water bath for 10 minutes. The resulting pear preserves this second time were a lighter color, maybe because I didn’t simmer the pears as long, although I really love the golden color of the first batch too. Both were absolutely delicious! Virginia warned me not to try to make more than a double batch at a time so I heeded her advice and made two double batches. The double-batches I made yielded 6 half-pints the first time and 3 pints the second time. 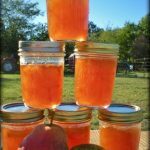 This delicious recipe was shared by a dear friend and is RancherMan's absolute favorite preserve. I'm happy to make it for him every year. DIRECTIONS: Peel, core, and cut up the pears. You will need 4 cups of pears ready to go for each batch. Make a syrup of 1 1/2 cups of sugar and 1 cup of water. (less water for very ripe pears) Boil about 10 minutes to dissolve the sugar and start the process of creating syrup, then cool slightly. Slice lemon into approximately 1/4" slices and remove the seeds. Add lemon slices to the syrup when you start the process with the pears, three or four slices to each quart of pears. Watch the boiling pears closely as they can burn very badly quickly. When they are done pack the pears in hot, sterile jars and allow them to seal. Don't forget to wipe the tops so that the seal can happen. Most of the new canning books call for you to hot water process the jars. About 10 minutes in a SIMMERING processor is plenty. Get it too hot and the syrup begins to boil and escape from the jars. Note from Ms. V: This recipe comes from my mother's Kerr canning book circa 1938. It is a slow process but so worth it. Thanks Virginia – you’re the BEST! * A word about our Affiliate Link – We are currently enrolled as an Amazon Affiliate. Occasionally I will insert an affiliate link into one of my posts if I think it may be of interest to you. I receive nothing from the manufacturer and I only link to products that I have used & love and feel you might love too. If you click on any of my affiliate links and buy something (almost anything, not just what was linked) I get a small referral percentage from Amazon. But here’s the really important part – the price you pay for your items is UNCHANGED. When you buy something through the affiliate link it’s a great way to support this blog. Nothing extra comes out of your pocket so please click often! This entry was posted in Blog Posts and tagged Cooking, Fall, Food Preservation, Gardening, Make-It-Yourself, Recipes on November 1, 2013 by Texas Homesteader. Do you leave the lemon slices in or remove them before putting pears in jars? Pear preserves sound so good. I’m trying to learn more about this, so I’m definitely saving for later! The pear preserves sounds delicious!! So nice of Virginia to share the recipe, and thank you for sharing with us!! Homemade pear preserves sound so good. Happy canning! 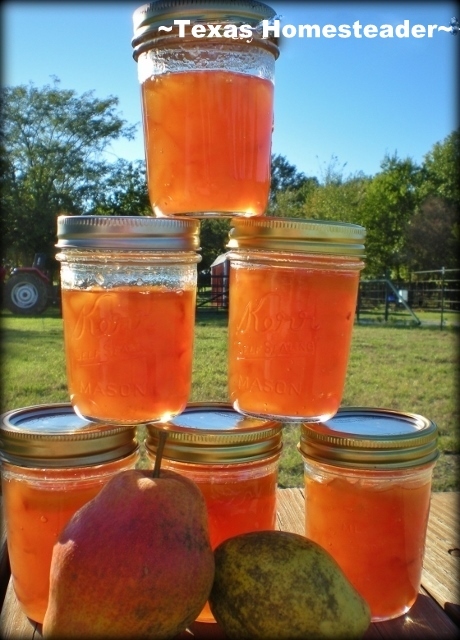 Oh what could be better than fresh pear preserves! Thanks for sharing your recipe at the Family Joy Blog Link Party this week!! I have some young pear trees so I hope to get to try this before too long! These look great. Thanks for sharing on the Waste Less Wednesday Blog Hop. I love homemade preserves -it’s like a bite of summer in the winter! Thanks for sharing on the What’s for Dinner link up and don’t forget to leave a comment at the party – Next week’s features that also leave a comment get pinned, yummed and tweeted! What a timely recipe! I have about 60 lbs of pears ripening in my basement and was wondering what to do with em! Now I know…thanks for sharing this on the blog hop! Your gonna have a great stock pile!! Yum! Thanks for sharing on My 2 Favorite Things on Thursday!! Hope to see you again! Pinned! I canned more pears yesterday Elaine, but made them into vanilla pears instead of preserves. I love to use them as a healthy dessert. What great tips! Thanks for linking up at Simply Natural Saturdays. This sounds delicious! Thanks for sharing at Merry Monday, hope to see you again next week! Looks delicious, such a pretty color! YUM!! Thanks for sharing this great classic way of preserving pears. It’s really becoming a lost art. Your preserves looks wonderful. Amazed by the beautiful color. Looks like there is more air space (1/2in.?) in your canned pear preserves; more than normal the way it seems. Is that the requirement for canning pears? My apple peeler hardly sees the light of day. Have had mine for a few years now and I think it has only been used twice. That’s not exactly correct. Yes, you leave airspace at the top of the jar, called head space, in order to accommodate the expansion of the food during processing. But it is equally important not to leave too much head space because the food may not expand to push out all the air at the top of the jar which can mean your jars may not seal properly. Also, part of the reason canned foods are shelf is because most food borne bacteria can’t grow in an anaerobic environment (to little air). If the jars are not full enough for all the air to be pushed out from expansion during canning, any bacteria will quickly grow and will not only spoil the food but may also make the consumer ill.
Wow! I haven’t blogged as regularly as I used to so it has been a while since I had the opportunity to visit your lovely blog, but I am so thankful for G’day from Oz where I have found you again! I am a home schooling parent and we had a canning workshop at our co-op recently. I have not gotten into canning personally yet, but it is a goal of mine. Cool! I did not think to use the peeler for pears too. Thanks for sharing with Wildcrafting Wednesday! Could you please share our link on your page? The picture is gorgeous! And I love that the recipe is from 1938. Just stopped by to let you know I am featuring this in a few minutes! I was unable to copy your beautiful picture to show off, but I am linking it up 🙂 Thanks for sharing! My grandmother makes a pear syrup that tastes so good that you will like your lips so fast you could beat your own brains out. HA. Thanks for sharing on Rural Wisdom and Know How. Great info and I love pear preserves! Thanks again for sharing your great info at TTF! Your pear preserves look delicious! I’d love to slather some on a hot buttered biscuit. I’ve only made pear preserves once. I usually make fig preserves, since we have a huge bush, but I DO love pear. Thanks for sharing your recipe. Sounds delicious! I will have to try this one. We just got a huge bag from our local supermarket (not as great as your tree!) but we’re enjoying munching through them so far. Gorgeous! And this look so yummy too! I miss my pear trees that I planted at our last house. sigh. I planted 2 trees here, but they take so long to produce. Thanks for sharing the recipe! I hope to have my own homegrown pears one day to try this recipe! Oh I’m so glad to get this recipe. My grandmother used to make pear preserves, she must have had, just like you, a friend who had a pear tree You never see pear preserves in stores even ones like local orchards which often carry different varieties of locally made jellies and preserves. So I will have to try this and see how it measures up to my remembrance. So glad you posted it and your friend offered the recipe.